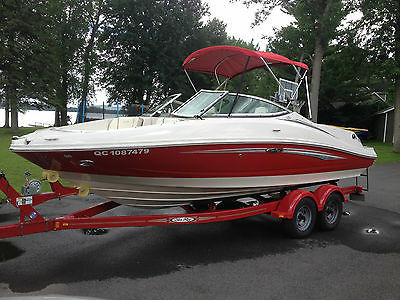 210 Searay Select 2007 with a 350 Magnum MPI 300HP in excellent condition. This is the big engine for this boat. 249 hours. Matching red shorelander dual axel trailer included. This boat is fully equipped. ( Keyless Dash system* Tilt helm with integrated steering wheel radio remote controls * Clarion AM/FM/CD/SIRIUS Radio capable with captain and stern remote controls * Rear facing Lounger * Snap in cockpit carpet * Full fiberglass inner-liner * Twin flip up bolster seating *Fire suppression system * Bow anchor locker and re-boarding ladder* Dual batteries with switch * Cockpit and Bow covers * Bimini Top* Smartcraft Instrumentation w/depth finder*Extended swim platform with padded mat. Stainless steel prop). Fresh water only. The boat has never remained in the water and kept in a garage at all times. Possibility of winter storage. Please contact me for more information. ¦ DESCRIPTION. 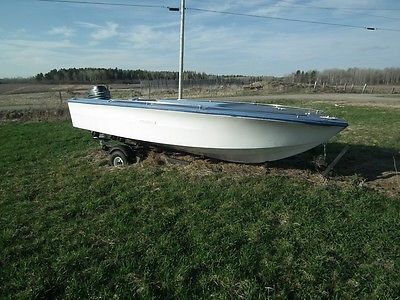 - This auction features a Sea Ray SRV 160 Motor boat with 50 HP Mercury Motor and good Trailer. - Selling as is......PRESENTLY NOT RUNNING - We no longer have a need for this boat and selling as is as a NON running boat. Here is the history: - We are NOT mechanical people and just want to get rid of this boat and not put any money into it. - It is a great project for someone who knows about boats. - Hull has no cracks or leaks, Interior has to be redone. - AGAIN.....SOLD AS IS.....BOAT NOT CURRENTLY RUNNING. ¦ PAYMENT. - Contact us for payment methods to pay on pickup. ¦ SHIPPING. - NO shipping Pick up ONLY. ¦ RETURN. - No Return. ¦ CUSTOM & DUTIES. - These charges are the buyer's responsibility. - Import duties, taxes and charges, if any, are not included in the item price or shipping charges. ¦ ATTENTION. - Please contact us for any problem inside eBay prior to leave any negative feedback. - We will follow up the problem and deal with good customer service attitude. - We usually reply within 24 hours. 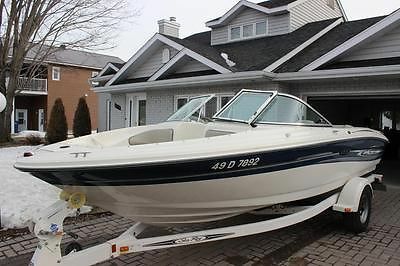 Like new 2004 Sea Ray 185 sport with a 4.3 liters Mercruiser engine. It has only 295 hours. Always stored in a garage after every rides and stored in a heated garage in winter. The boat interior, exterior and the engine is in showroom condition. The trailer is the original Sea Ray trailer with matching colors and has hydraulic brakes and folding tongue. It comes with cockpit canvas, one rapid canvas when trailering and one for the open deck, see photos. As you see, I am in Canada but I made a research on how to import a boat in the USA and it's pretty simple...you'll have to fill simple paperworks for the motor boats and one form for the trailer. I'm ok to help you with that and I'm able to meet for the delivery at the Lacolle-Champlain, NY border to help you, I'm about 2 hours of driving from there. I'm ok if you want to pick up by a third party transport too, I can be in touch with him and help with that. Don't hesitate if you have some questions.